When you hear someone talk about Big Data, ten to one it’s a speaker who doesn’t know the first thing about data, and therefore thinks that all Data are Big. Or worse, if Data ain’t Big, it’s not worth mentioning. Nothing could be farther from the truth. Nonetheless, Big Data are dominating the discussion to such an extent that you’d almost forget the small stuff was there, let alone it’s important. At the latest Soundbites, Neil Gains from Tapestry Works put paid to that illusion. Under the title ‘Does Size Really Matter’ he gave a fascinating talk about the use of market research data, ‘Small Data’ by any definition, to capture the finer nuances about how consumers interact with their brands. In other words, there’s Big Data, the bit in the middle which I guess we should just call ‘Just Data’, and Small Data. And life as a marketer starts with the latter. How do you get hold of Small Data? By asking people questions, and capturing the answers. But asking questions is an art, and Neil gave away an interesting nugget of information about the ideal way to do it: you don’t ask with words, but with pictures. Words can be (and will be) interpreted in different ways by different people, especially across different cultures. Pictures, on the other hand, will be interpreted quite consistently, so if you can ask your question in the form of showing a picture and ask people to connect an answer to it, your results will be much more comparable across the audience. This is especially important when you’re dealing with emotions and all manner of nuanced attitudes and behaviours around your brand. Collecting responses from a small set of consumers and interpreting those, Small Data in other words, is where true understanding of the Customer Experience starts. 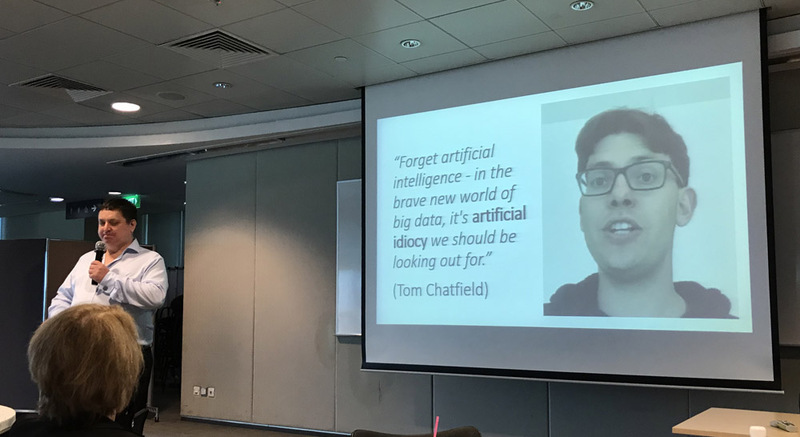 Neil’s story is an interesting counterpoint in a world where Big Data are increasingly dominant, because they can be combined with bots and Artificial Intelligence platforms. Large datasets are increasingly popular, as they can be used to teach AI to interpret certain patterns. And these are true words. As we can all see in our daily lives, small data can result in small misunderstandings. Big Data can magnify that into really big misunderstandings. If you want to issue a warning sign about Artificial Intelligence, that’s where you should point the red arrow. Get the basic knowledge right, and create the right set of assumptions from there. The quality of that set of assumptions will ultimately determine the quality of the intelligence you create with it. In a world of Big Data, life starts with Small Data.